With our latest versions, we have broken our decades-old concepts into an extremely flexible three-module approach to the disbursements side of our customers' accounting. CheckWriter -- checks awaiting printing on your check forms. With this approach our customers can go into as much detail and variation as they want, without any extra steps, and with extra security. We're on the threshold between versions of our general-purpose applications, and these pages describing them are incomplete -- in some cases very! We're working on this, so please check back, or -- even better -- please contact us! 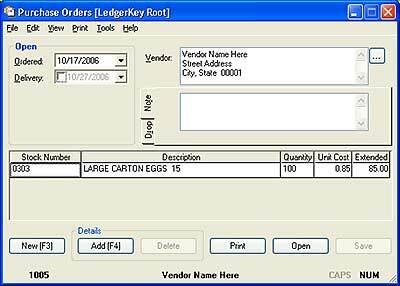 Assembles items from inventory database into vendor (purchase) orders; prints Purchase Order; processes received items into inventory, updating quantities and costs. This is the initial window that comes up when you launch our Accounts-Payable application. When the ordered inventory arrives, just retrieve the purchase order to the main window and press F8 (or select File>Receive). If you received all the items at the quantity and prices of the original purchase order, just click Select All (or press Ctrl+A). If you want to receive only some of the items, you can scroll down through the lines and press Spacebar to check off the included lines. You can also move to the quantity or price cells in the grid and change them. Clicking Save saves these values. 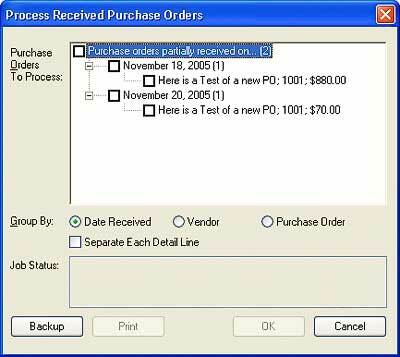 After receiving the purchase order, you will normally print a "hard copy" or Edit List and process the information. Selecting File>Process (or press Ctrl+P) will display a window very much like this. This is a checklist of the purchase orders that have been received. Just check off the ones you want to process. Click Print to print an Edit List and compare it to the vendor invoice. If you need to make changes, all you need to do is repeat the above process to "receive". When you click OK, the application can create an invoice in our Accounts Payable application and update the inventory database with all the received items. If the order was only partially received, the order remains open, and you can repeat the process for additional items, or you can cancel the order. After processing, you can leave these processed orders in the database for future reference. 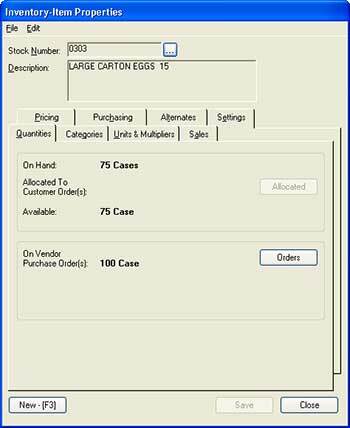 At any time while you're working with a purchase order, you can press F9 and to open a window showing the current vendor information. 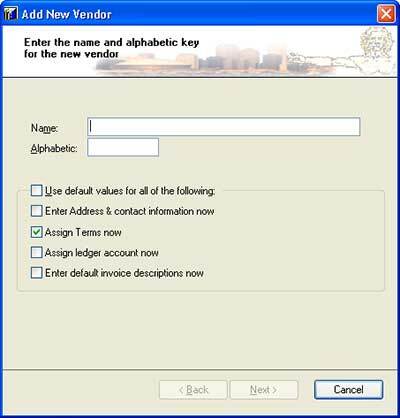 We use a familiar Windows "wizard" routine for adding vendors to the database. In this way, you can be prompted for as much -- or as little -- information as you like when adding vendors. Click here for more on how these wizards work. You can also press F7 (or select File) and review the current on-hand quantities and all the other information for an item. If there are vendor orders for this item, clicking Orders will access the Find function, showing a list of all pending vendor orders for this item. Just press Enter to select a purchase order.